Optimum equipment efficiency and maximum equipment life are essential aspects for running a successful bakery. This is achieved through maintaining routine adjustments, lubricating equipment parts, and replacing damaged or worn parts. KASCO fully trained service professionals ensure your bakery equipment is running up to these standards so your business is reaching its full potential. KASCO offers a variety of comprehensive preventative maintenance programs as well as quick and efficient repair services that reduce expensive equipment downtime. Contact your local KASCO representative for more information on equipment maintenance and repair for bakeries. KASCO manufactures and stocks a wide variety of reciprocating bread slicer blades to fit the most popular commercial bread slicing machines. 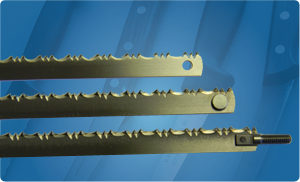 Our professional technicians carry an full inventory of reciprocating blade sets in traditional scallop edge profiles, as well as our new ABT Artisan Bread Technology bread slicing blades designed for whole wheat, sourdough, multi-grain and nutty breads. A cost effective regularly scheduled blade replacement program will take the worry out of replacing your bread blades to ensure your breads are always sliced clean and straight with little to no crumbing. KASCO provides maintenance and repair on the top brands in the industry. Our fully trained service professionals have experience with Oliver, Berkel, Doyon, JAC, and other food equipment brands. These technicians ensure your bakery equipment is running properly for maximum efficiency. Doyon Equip. Inc. has been a manufacturer of bakery and pizza ovens for more than 50 years and offers an extensive line of products including bread slicers, mixers, & proofers. 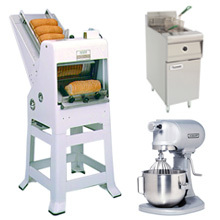 JAC Machines manufactures bread slicers, dough processing machines, dividers, bread molders, and bread provers. We are committed to satisfying our customers' expectations for robust, dependable machines that improve product quality & reduce total ownership costs. Freidrich Metal Products, Co. Inc. is an innovative manufacturer of a broad range of equipment for the food processing industry. Bakers Pride initiated one of the most dramatic innovations in the history of American cuisine by inventing the modern production pizza oven.